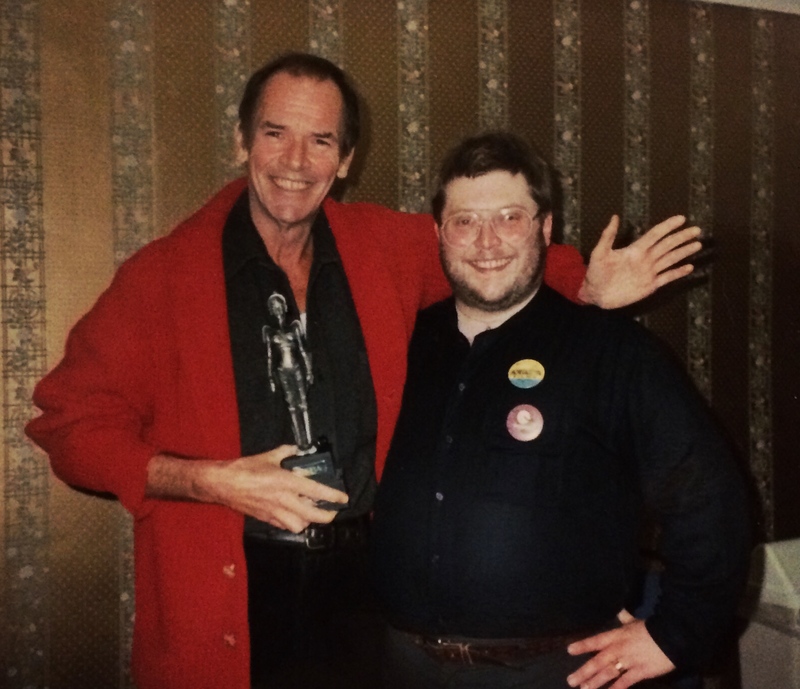 Here’s a very brief clip from Manchester’s seventh Festival of Fantastic Films, back in 1996, as I introduce the charming David Warbeck to his audience. It’s extracted from a longer compilation of festival footage edited by Elmar Podlasly. Sometimes, a great opportunity comes along and you just have to wing it. I met the lovely Catriona MacColl on the first day of the 1996 Festival of Fantastic Films in Manchester, and we hit it off quite well. The great thing about this particular event is that the guests and members mix freely, most often around the bar, and there’s a level of casual intimacy you could never get at one of those massive autograph fairs. That encounter proved rather helpful the following afternoon, when the festival chair approached me in somewhat of a fluster and asked if I could fill in as on-stage interviewer for David Warbeck, as the original host hadn’t turned up (I knew the person in question and later ascertained he’d never actually agreed to attend). Much as I disliked taking over without my usual investment in research, I figured it would be fun, so headed downstairs to meet David, at which point I discovered (a) he was fresh out of hospital following a vicious attack at his home, (b) was still feeling extremely frail and (c) would rather not be there. Thankfully, Catriona, who co-starred with David in Fulci’s The Beyond, was on hand to reassure him I was “one of the good guys” (award-standard acting, there) and the tension ebbed away. As it turned out, David was one of those interviewees who was a breeze to work with; I simply steered our conversation along as and when needed, occasionally pointing him towards the films I knew the audience was particularly interested in hearing about. In retrospect, David’s frailty might have been exacerbated by the cancer which would take him from us the following July, aged just 55 (I’m not sure if he was aware of it at the time we met). Sadly, I didn’t have a chance to record the interview and so produce a version for publication, although the organisers did later release an edited video, parts of which appeared as an extra on Grindhouse’s 2016 Blu-ray release of The Beyond.